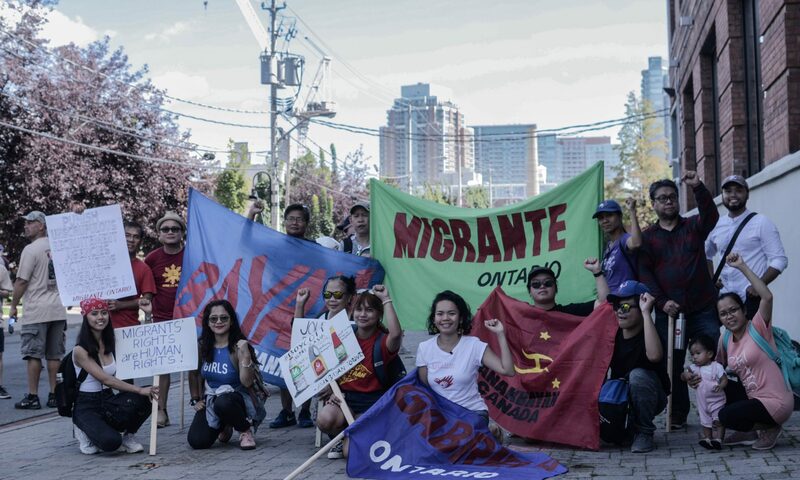 It occurred to me that maybe Anakbayan Toronto members have written blog posts or that perhaps some of their speeches have been uploaded on the internet, whichever platform. I’m weird this way but this is what I usually do if I want to get to know the person/people better— I usually do this when I am intimidated, inspired, and in awe. But ultimately, I do this because I don’t want to say something stupid by accident and that I am honestly so scared of asking them in person about what propelled them to become activists because sometimes my introversion can’t muster up the courage to perform this basic life task, haha (my friends sometimes find this problematic, but okay). I have probably said this so many times but I’m saying it again: it was mainly my cousin Nur Jannah who inspired me to resist authority, to campaign for rights, and everything else that we need to address, and everything else that we need to bring into the (mainstream) discourse. Okay, tatay ko rin but my Dad’s political analyses came mostly from a political standpoint— which I dislike now sometimes upon realizing that political science is much more concerned on the bigger picture, thus obscuring those tiny yet crucial details of the story (side note: this is where my love for sociology comes in, haha). Unlike her, though, I have spent most of my time as an “activist” behind the screen— virtually campaigning for the rights of the oppressed; criticizing the government and its policies; exchanging words with an individual whose views opposed mine; writing blogs; and vlogging. I am perfectly aware of the importance of doing these things and the impact they create. I don’t need to be reminded because I spent my high school life writing and joining press conferences. I also took Development Communication for two years. But articles by bell hooks, Crenshaw, Kadi, Luxton, and other scholars, who have articulated the need to apply all these theories (you’ve been learning in the academe) into practice, have compelled me to ask this question: what am I doing? I read Ate Rhea’s speech published 5 years ago. Ate’s speech explained why she became an activist, condemned Labor Export Policy (LEP), and called for genuine democracy and independence. What was striking about it is that she cited both the impacts of LEP at personal and structural levels. She urged us to be aware of the ways in which the system we are situated in perpetuate “forced migration”, and that our taxes are being used to sustain those mining companies that are driving Filipinos out of their homes, of their lands because those companies are under the protection of the armed forces of the Philippines (Gamana 2013). As a daughter/niece/grandchild of caregivers, her personal experiences resonate with me. As a member of the academic community whose duties are to critically analyze issues and events, to challenge inequalities, to come up with feasible policies and to mobilize (like-minded) people, her advocacies and the advocacies of Anakbayan will be my impetus to transform these theories I have been (and will be) learning at UofT into praxes. Writing this reminds me of the time I was called a communist, a leftist by a friend who claimed that capitalism makes everyone better off, that people only need to compete in order to improve the quality of their lives. Writing this reminds me of the time I was told not to join protests/rallies, to conceal my leanings towards leftism/communism because they would jeopardize my career options in the future. Writing this reminds me of the time I questioned why family members had to resort to caregiving even though they have degrees in Business, Education, and Nursing. Writing this reminds me of the time I had (and I still have) to tolerate classist taunts because I did not (and I still do not) have an affluent background. Writing this reminds me of the time I wondered why my grandparents, aunt, uncles, and cousins had to farm on someone else’s land and/or why my grandparents had to sell John Lloyd, their kalabaw. I obviously did not have the theoretical framework to analyze these issues back then; regardless, I have always been advocating for equity, social justice, and human rights. And Anakbayan provides the perfect platform, the perfect opportunity. Fatima’s note first came out on her Facebook account. Some parts were edited. Previous PostPrevious Rise, Resist, Unite!